A New Hampshire-based project to study marine debris at sea and on the shore, incorporating waste-to-energy and recycling as part of cleanup efforts. An important part of this project is detecting derelict fishing gear ("ghost gear") underwater so that we can target areas for future removal. 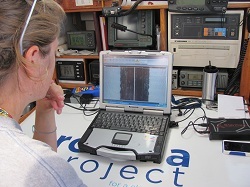 An initial side-scan sonar survey was conducted September 16, 2008 aboard the University of New Hampshire research vessel Cocheco to locate derelict lobster pots, and follow-up work was conducted in August 2011 aboard the Rozalia Project for Clean Ocean's vessel American Promise. Results from these sonar surveys are detailed below. In early August, 2011, we worked with the Rozalia Project to survey 28.64 miles of waters off the coast of New Hampshire, with the objective of identifying potential derelict lobster traps. Derelict gear is fishing gear that can no longer be retrieved because their surface buoys have been lost. Surface buoys can be lost for a variety of reasons including weather and storm surge but most often due to interactions with recreational and commercial vessels. This work was supported by a grant from NOAA, along with support from Optima Bank in Portsmouth, NH and the Kittery Point Yacht Yard in Kittery, ME. Potential derelict traps were identified based on looking for unusual trap configurations that would indicate that the gear may no longer be actively fished: single traps, a line of 2 traps, lines of traps that made a V or W shape (as if they had been dragged), clumps of traps or traps with no corresponding buoys on the surface. Clumps/groups of lobster traps are often located at substantial terrain changes, for example, from sand to rock ledge. A higher volume of potential derelict lobster traps exists in proximity of highest density of active fishing gear. Derelict lobster traps are not static. 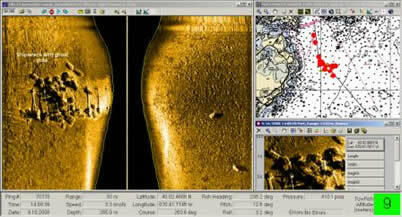 During the survey, American Promise re-surveyed a shipwreck that was part of a 2008 sonar survey. During the 2008 survey, the top of the wreck was covered by over 20 derelict traps. 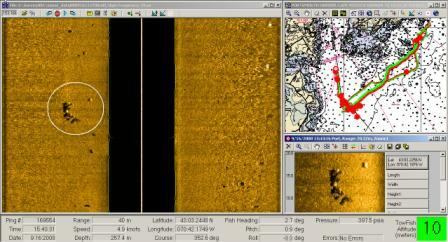 During the 2011 survey, the sonar image shows a wreck with no derelict lobster traps on it, just an active trap line to its port side. The popularity of the Portsmouth Harbor area for fishing and its use by many commercial and recreational vessels (which have the potential to cut lobster buoy lines in transit) led us to concentrate our first survey in this area. 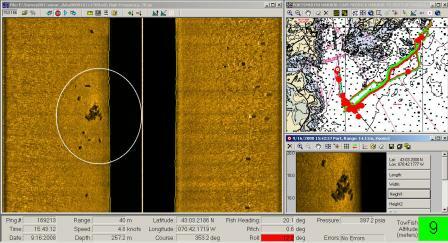 Approximately three nautical miles of sonar tracks were made from Portsmouth, NH to Kittery, ME. An astounding 300+ derelict lobster pots were identified. Pots were generally observed in piles of three or more and in the vicinity of actively fishing gear. Pots were determined to be derelict if there were no obvious lines around the gear and/or they were clumped together. 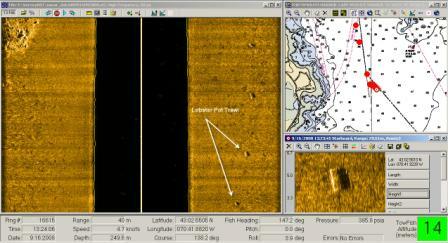 We gratefully acknowledge L-3 Klein Associates, Inc. for their assistance with sonar work and data interpretation. The tracks originate in Portsmouth Harbor off New Castle Island, turn toward Kittery, Maine and loop back to Portsmouth. The images above show clumps of lobster traps within the white circles. 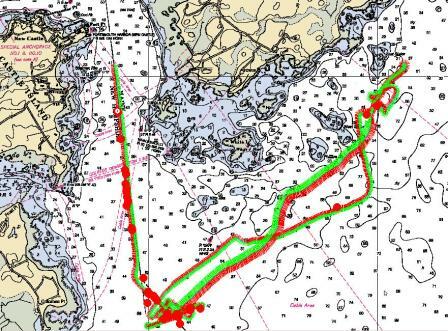 The white arrows point to lobster pots in a trawl. In the image above, there is a shipwreck covered with ghost pots. This study is funded by NH Sea Grant and through a grant from the NOAA Marine Debris Program. Site design and hosting by the University of New Hampshire Cooperative Extension.